Thanks for your encouraging feed back on our websites. Our websites are a lot of work for Stefan and myself, but well worth it when see how it can help and bring people together across the world. Asher is still our reseller in Australia, I think he’s moved to Melbourne now. For what I understand you are doing, I wouldn’t think Pro PP would be really worth the investment. The update is quite a hefty sum to fork out, which I consider a great investment if you are designing and running regularly projects through a CNC. However, if you just cut occasionally curved parts, drawing and setting up in CAD works well even if it can be a bit longer. You seem well organised and set up for what you are doing at the moment. There are 2 differences between Standard and Pro, Standard will not draw nor manage hardware and when you set up a cabinet with slopes cut outs etc. you will not get the separate part drawings. I Turn my Dynalog dxf files to G code thru Cut2d and save them on a thumb drive. Seems to work ok for what I need at the moment. I use cad for creating dxf drawings for all the funny shapes that I want to cnc, I got involved late last year in producing some Louvered doors for a client, Created the housings on cad, worked out great. Not sure that I need to get the Pro PP version, Whats the difference between the standard version that I have and Pro Version ? I purchased Polyboard as Version 5 was being developed and it has been a great journey learning and evolving as version 5 has taken shape to this point. I think it is fantastic what you and Stefan are doing with this site on the net, just love clicking on and checking out whats going on in other parts of the world. I understand perfectly where you are and how you work. do you use Dynalog files to run you CNC? Upgrade to Polyboard Pro PP cost £1957 – 70% of the price you paid your Pro version. However, I’m not very enthusiastic about selling the latest version as I’m finding a lot of the problems when loading DXF files and the imagery commands are not up to the last versions either. What do you want to do with Progecad? where did you buy your Polyboard ? I often wondered about the version I purchased back then. I am not interested in mass production of my works, I have been in the furniture industry 50 years this year so I have seen many changes in production over the years. I have a small cnc Router ( 1800 x1200 Bed size ) which I used for drilling carcass parts & and enjoy doing shapes and odd things on it, I use Blum,s Dynaplan for my set outs for Hinges, draw runners, shelf holes & carcass holes. I enjoy building my projects from the ground up as they say, so I enjoy cutting and edging my panels ( we use white melamine 16mm board here for most of our stnd cabinets with various finished doors & faces. If I upgrade to Polyboard Pro P so that I can manage those shaped panels ( not overly concerned with the hardware side as I use Blum hardware and keep a good range of the bits I need ) what would the upgrade cost be ? I have been playing around with ProgeCad on there 30 day free trial and I may be interested in purchasing that also. Polyboard Standard will not manage hardware. This means that parts drawings will only be rectangles with no positioning of drillings or grooves etc. I’m not even sure that the version prints part drawings. In general we don’t sell the Standard version as although it allows one to build more complex projects with slopes etc. you can’t build these project because you can’t output a printed dimensioned drawing of the part. The Pro version will manage hardware and print dimensioned drawings for each part. If one doesn’t have a CNC this version gives everything you need to build any project, hardware lists, part by part drawings with the hardware positions marked and dimensioned. The Pro PP version does the same except it will also write the files to drive a CNC router. The version best adapted depends on the way you work. In this case Polyboard Std can be a good option because you can design and price and then send the file to a supplier to order the parts. It would also be possible to simply use the free version as this version has all the design functions, however it’s not possible to get instantly the price of the project as you design, a great asset if you are quoting for a job. As well as the Standard version outputs the cutting lists for one-off projects that you might want to build occasionally in shop. Of course, these are the 2 extremes and various mixes of the 2 situations might be better for some companies. However, I do feel that, in today’s context, small businesses will have to focus more and more on the jobs they are good and efficient at, design, proposing solutions and installation, whereas cutting and manufacturing will be less and less profitable and better outsourced to businesses organised specifically around these operations. I purchased Polyboard back in November 2012, and as I work on my own I bought the Standard version. Looking at your software store I see you only have the Polyboard Pro PP and the Polyboard Pro P.
I am using the latest update 5.14 at the moment. Is there any difference between my standard version and Pro P ? Polyboard will not print directly a scaled drawing. The drawings are dimensioned and best fitted to the paper size. To print to scale you have to open the DXF files in CAD and print from a CAD program. In general dimensioned drawings are enough to build a project but full-size templates can be useful for marking our specially shaped parts. Strictly speaking, Polyboard can’t put handles on a cabinet but can only provide the machining for them. 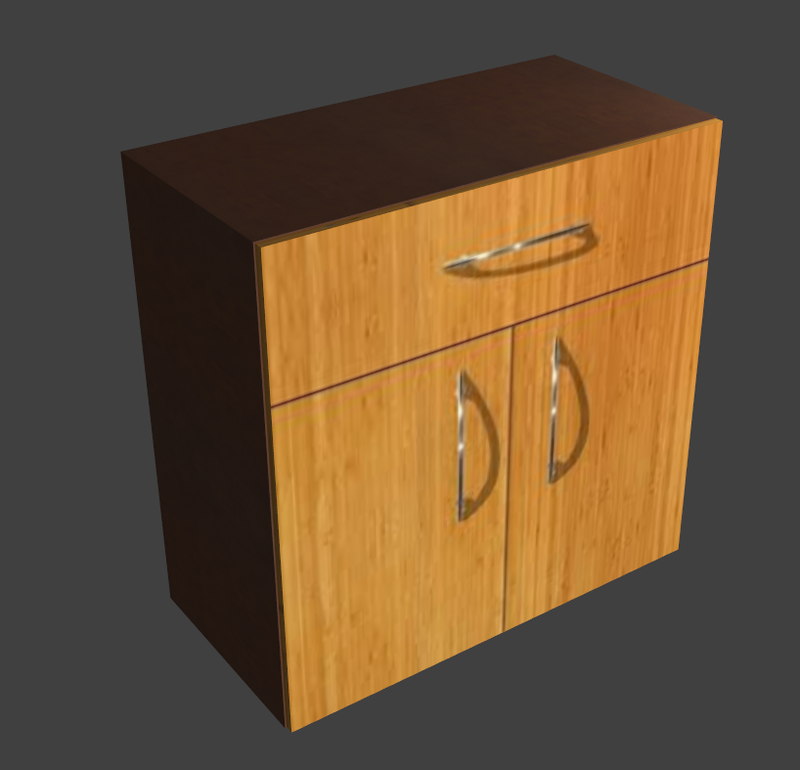 For display purposes, it’s possible to map an image file onto a cabinet that includes the handles. This is just a cabinet with a picture of a door with handles mapped onto the facade.